State and local services have been talking through possible emergency scenarios in public housing high-rises trying to identify who is actually responsible in different situations. Peter Murphy looks at the progress to date. Now in its seventh month, Inner Sydney Voice’s Community Resilience Project has advanced through its first stage of community consultation about the issues in coping with an emergency, to building a working group that can identify priority tasks and start to create education programs to address them. “We now have 15-20 people in the Committee, and they have met four times. 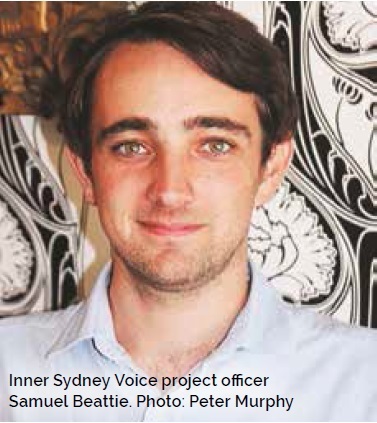 People are coming to me asking if they can come to the meetings, rather than me reaching out to people to take part,” said Samuel Beattie, the project officer based at Inner Sydney Voice, the tenant advocacy organisation. “One of the issues we came up against early is ‘alarm fatigue’, because the smoke alarms continually go off in the estates, triggering the Alert Alarm on relevant floors. Everyone ignores these alarms, and so there is very low awareness about another alarm, the Evacuation Alarm, let alone the need for a Personal Emergency Plan,” said Samuel. “Behind every door is a ‘Floor Evacuation Plan’, which hasn’t been checked and upgraded in years, and which no one reads. But if there is a major fire, or flooding, residents will have to know what to take and how to get out, and the relevant building management will have to be able to assure the safety of the residents in the emergency,” he said. The Redfern Surry Hills Community Resilience Committee has been talking through the possible emergency scenarios, and trying to identify who is actually responsible in these situations. The project is a direct response to the Sendai Framework, an international collaboration in 2015 on how to respond to calamities. Sendai is the region of Japan where earthquakes and a tidal wave devastated communities and then triggered the Fukushima nuclear meltdowns, in 2011. The Australian government played a strong role in the Sendai Framework, which developed the concepts of an “all-of-society” approach and “shared responsibility” in coping with an emergency. “Key partnerships in the community enable the initial shock of an emergency to be absorbed, the recovery to develop faster, and the community to emerge stronger” said Samuel. The Committee is now grappling with the very clear but narrow focus of Fire and Rescue and the Police in an emergency, and the vague sense of responsibility of land owners and body corporates. “While commercial buildings and workplaces are legally required to have emergency plans, regular drills, and a structure of Fire Officers to implement the plan, public housing estates and private residential buildings are not,” said Samuel. “We are discussing the need for new laws”. The project has another 17 months to run, and is yet to start its third stage, the rollout of programs to address the priorities identified by the Committee. After stage three, the lessons learned will be available for application across Australia. This project has been running since June 2017. For more information please contact Samuel Beattie on projectworker@innersydneyvoice.org.au or phone 9698 7690 or 0413 596 583. ◄ Disaster Resilience: How does it impact you?